Craft beer fans on the East Coast greeted the avalanche of West Coast immigrant breweries with mixed feelings. On one hand, very good beer would be available at, ultimately, a better price and presumably fresher brew dates. On the other hand, these well-financed large craft brewers would put pressure on our local friends and neighbors. It’s hard to predict whether choice will expand or contract, but our money’s on the latter. Still, it’s hard to get upset about the availability of relatively consistently high quality beer. These big guys got big by avoiding mistakes and making beers people would return to. When we first visited Green Flash’s San Diego brewery in 2006, neither we nor their brewers would have put them on a likely list for Eastern expansion, but they’ve produced a huge range of very hoppy and very tasty beers that have sold well in the east. Their purchase/merger with Alpine has given them some additional street cred and some additional top shelf beers for their portfolio. 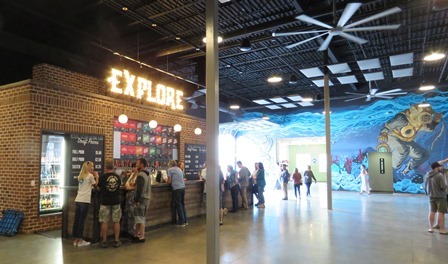 Their Virginia Beach tasting room has a mix of Alpine and Green Flash beers from the West Coast as well as house brewed flagships from the east. As far as we know, however, this “bi-coastal” brew is only brewed in California at the present time. 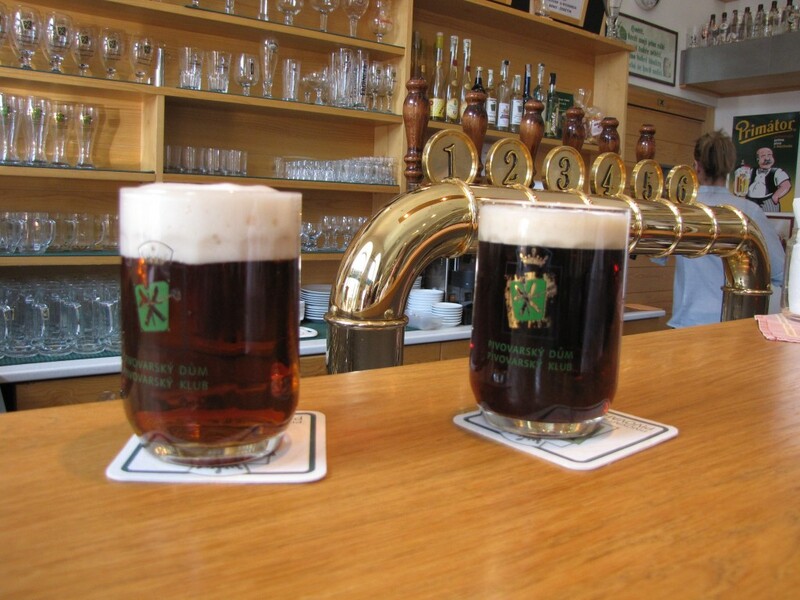 Zwickel beers were once hard to find in Germany, but there are dozens of them there now and an increasing number in the US. 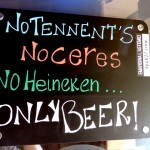 They’re always unfiltered and usually lagers. The tastes vary greatly according to the brewery’s house yeast, but most are smoothly chalky rather than the fruity funk of some unfiltered ales. 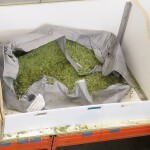 Green Flash has chosen a session lager for their zwickel- lower in alcohol than most of the zwickels we’ve found in Germany, but nevertheless with a satisfying rich taste; the yeast helps round out the mouthfeel and make up for the relatively low gravity. Tasting notes: Chalky, yeasty, and mild, but with some fruity Hallertau hops. Even, softly sweet and clean flavors ride throughout making it an sasy drinking session beer. Ellie found a persistent metal bitter but also noted the cleanness of the brew. Those Hallertau hops pushed my rating higher than hers, but we both thought it was an above average lager. 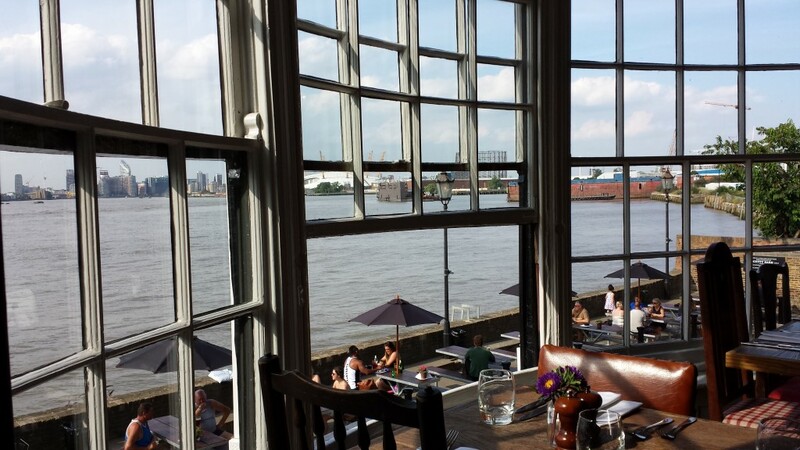 We’ve tasted more than a thousand beers in the last year, so it would seem unlikely that we’d keep returning, at least in this blog. But whenever we’re in the Harrisburg area we find an excuse to detour through Hershey on the way back and lose another Sunday afternoon to the Troegs brothers. It would seem a waste not to share the triumphs here. The scratch series is every brewer’s dream—the chance to brew anything you can think up using some of the best equipment and collaborating with a team of exceptional brewing professionals. It’s not like they never miss, but the odds of running into a success are so much higher than pulling a bottle of Whatsitbrau off the shelf that we never miss the chance to see what they’re up to. Tasting notes: Tartness and bitterness overlap, twist and turn, as citrus and citrus peel and muddy Tangerine frolic on a dry chalky yeast carpet. Lasting bitter is more a peel sensation than a hop. Not smooth and moreish but decidedly interesting. Food Pairings: Big fruity hops overpower a mild cheddar but an aged hard sharp cheese is a great match with the fruit supporting the biting sharpness and each get a chance to shine. Flavor – citrus is evident, watermelon is harder to find. GO TO ITALY FOR BEER? YOU BETCHA! 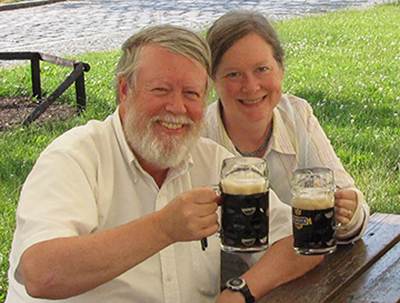 The Beer House Club is our favorite beer bar in Florence. There are many great beer bars in Florence, but we like the low key atmosphere, hugely knowledgeable owner-manager, and friendly international clientele. Few of their beers were home runs, but there were no strikeouts and a good many doubles off the wall. Next time there we’ll tuck into their extensive bottle selection but the decabar (ten taps) kept us in drafts on our last visit. 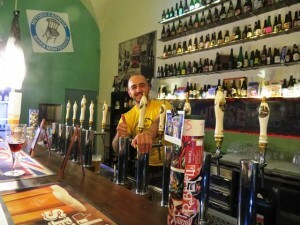 PBC is Piccolo Birrificio Clandestino, a brew pub in Livorno, Italy. 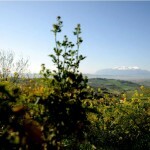 One of the reasons Italian craft beer has soared in the last few years is that brew pubs have little difficulty distributing their excess capacity to the plethora of beer specialty bars that flower in every city of size in Italy today. 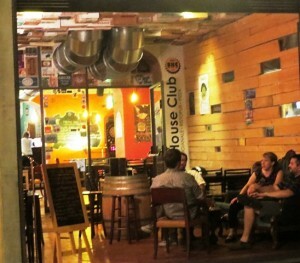 Beer House Club somehow sorts out the disasters from the winners and lets you travel the peninsula without leaving your seat. Florence’s Beer Club House would be a destination beer bar even in Portland or San Francisco; in Florence it has a niche of its own. Although there are the requisite double digit taps and a huge range of hard-to-find bottles, it’s the care in the selection that sets it apart. The owner/barkeep is a beer enthusiast who is good for engaging conversations about the Italian beer scene – in exceptionally good English. The bar is located near the river, no more than a ten minute walk from the Uffizi and even less from Santa Croce. Unlike most of the good drinking places in Florence, it opens at noon, so when your feet wear out, it will be ready for you. Today’s beer probably won’t be there when you get there, but you’ll surely find something like it. IPAs have taken off throughout Europe. They’ve been popular in Scandinavia almost as long as they have in the US, but they have exploded in Iberia and Italy in the last few years. The Wall is typical of the craft revolution. 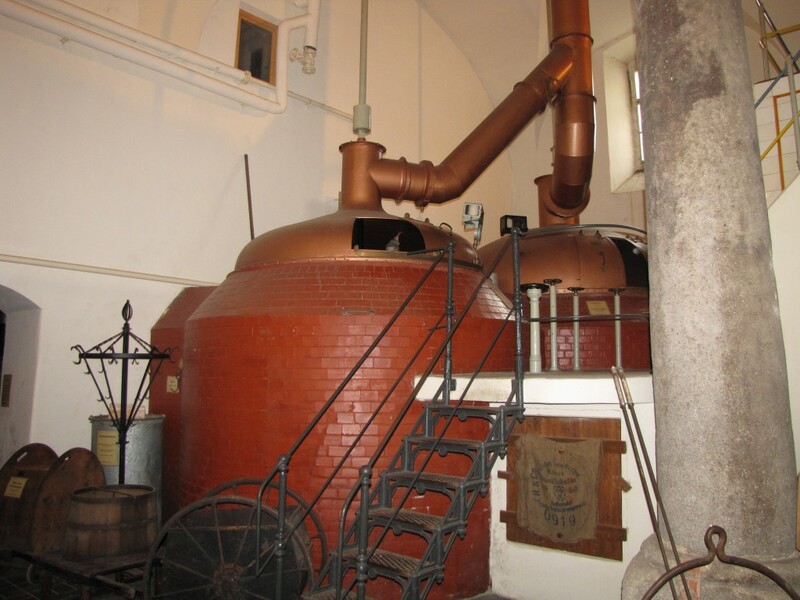 Located in Venegono Inferiore not far from one of the pioneering Italian craft breweries in Cumo, it’s only a few years old, but like so many new American craft breweries, their learning curve has been pretty quick. Tasting notes: Lots of hops fill cauldrons of metal flavors, but by the end they add fruit as well as some grass and herbs. Caramel malt seems to add to the metallic profile. As it drinks, hops get sticky and pushe it close to a double IPA. 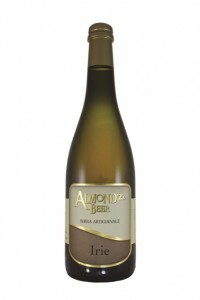 Almond’22 beers immigrate to America with some frequency. They tend to be adventurous and expensive. We’ve had pink peppercorn and smoked ales from them in past years. On its home field, however, the brewery offers more standard offerings and this spiced golden ale – really a Belgian-style wit—is one of them. Beers like this are a good reason to leave the oh-so-tempting American craft brew scene and sample some of what the rest of the world is up to. The brewery got its name from the building it occupies. In 1922 ranks of low wage women workers toiled to peel the rich almond harvest from the surrounding area. The brewery’s founders chose the name as a tip of the hat to them. 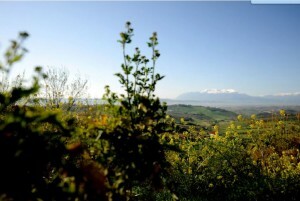 While many of Italy’s cutting edge breweries are in the north, Almond’22 is located near the coast in Pescara in Abruzzo, a province stretches from the Adriatic to the Apennines in southern Italy. Tasting notes: The brewery calls its Irie a “chiara”, which literally means “clear.” This most certainly not, and the term can actually refer to any light colored brew. It’s basically a wit beer with lots of flowery and fruity tastes. Plenty of yeast remains in the beer, which is fortunate, since this strain of yeast is a perfect match for the hop and malt flavors. Oranges, peaches and roses all take turns in this chalky, tasty and interesting wit-like beer. The brewer says there are flavors of rhubarb “without the characteristic sourness.” Maybe it has; I surely wouldn’t know. It is a good drinkable wit style beer that we tasted for an affordable $4 for a small glass at Florence’s Beer House Club. Not exactly German Bier Garten cheap, but a good deal easier on the Visa than the large bottles that make it to America.